I bought a great cookbook earlier this summer but haven’t written about it yet. I’m still not going to write about it because there is so much to say and more recipes to make, but I will let you know about one recipe I tried. I had some very overripe bananas and wanted to find a new bread or cake recipe to make. The book was sitting on my kitchen table at the time so I looked in the index and there was a banana cake. Done. The cookbook is Dinner with Jackson Pollock by Robin Lea and one of my new favorites. I’m not going to say anymore because it’s going to be a future blog. Let’s just say you should go out and buy it. 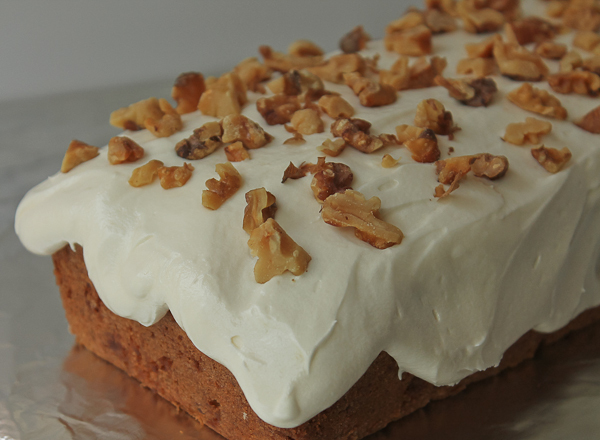 The recipe is called “Banana Cream Cake” and it’s baked in a 9-by-5-inch loaf pan. 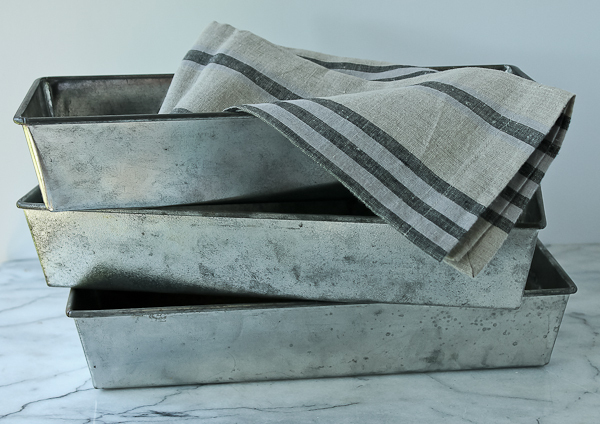 I am always looking for ways to use my vintage cookware, so I found these great old pans in my Culinary Cellar and decided to go for it. The pans are 13-by-4-1/2 inches, so I had to adjust the baking time, but they make such pretty long loaves! I don’t know why I don’t use these pans more often, but certainly will play around with them now. I wonder if this size is even made anymore? In the cookbook, the cake is shown frosted as below, just sort of artistically hanging over the side instead of frosting all over. It’s Jackson Pollock after all, right? It looks like snow hanging off a roof. I love it. The recipe makes a ton of frosting so you could ice the sides of course, or save some of the frosting for something else, but if you love cream cheese frosting, this one’s for you. More on Jackson Pollock and his many other great recipes and stories at a later date. In the meantime, enjoy his banana cake. Preheat oven to 360 degrees. (that's not a typo; it said 360, not 350). Grease a 9-by-5-inch bread pan. As I mentioned above, I used a long loaf pan, 13-by-4-1/2 inches and it worked great. You could probably make individual loaves if desired too. Whichever you choose, watch the baking time closely. For the cake: In a large bowl of electric mixer, cream together butter, sugar, and vanilla until light and fluffy, then add eggs one at a time. Beat until well combined. In a separate bowl mix together the mashed banana, sour cream, and lemon juice. In another bowl, sift together flour, baking powder, baking soda, and salt. Add half the banana mixture to the egg mixture, followed by half the flour mixture. Fold until well combined, then repeat with the remaining ingredients. Lastly, fold in the chopped nuts. Pour batter into prepared loaf pan and smooth top. Bake about 1 hour. (Note: my long loaf pan only took about 40 minutes. If you use the 9-by-5 pan, I would check it at 45 minutes and go from there. If you are making individual loaves, I would check them at 30 minutes.) When done, allow to cool in pan about 5 minutes, loosen edges and turn out to cool completely on wire rack before frosting. For Frosting: In large bowl of electric mixer, cream together butter, cream cheese, and vanilla until smooth. Add powdered sugar, ½ cup at a time, and beat on low speed until combined. When all powdered sugar is added, beat on high speed until frosting is smooth. Spread over top of cooled cake. Sprinkle with chopped nuts. Sometimes I have let my bananas go to almost black and they have the strongest flavor. Bill always knows when he sees those kind of bananas on the counter that bread or cake is coming!